Ustad Amjad Ali Khan is the sixth generation Sarod player of the Bangash lineage which traces its roots to the ancient Senia Bangash School of music. Amjad Ali Khan was born on 9th October 1945 in Gwalior Madhya Pradesh. His father Ustad Hafiz Ali Khan from whom he received his talim was a musician in the court of the royal family of Gwalior. He gave his first solo recital at the young age of 12 years. His love for the instrument and strong passion for music has enabled him to be recognized as one of the great Sarod Players in the country. Ustad Amjad Ali Khan has contribute immensely in the field of classical music by popularizing the Sarod. He simplified the instrument by removing a few strings and the resonance gourd. He plays the Sarod with his finger nails instead of finger tips a difficult technique genius he has created many enchanting new ragas such as Shyman Shree, Kiran Ranjani, Haripriya Kanada and several more. In 1977 he founded the Ustad Haafiz Ali Khan Memorial Soceity which even today, organizes concerts and annually announces the Haafiz Ali Khan Award to outstanding and deserving classical musicians in India and abroad. Among the numerous awards for his contribution to Indian classical music are the Padma Shri in 1975 the Sangeet Natak Akademi Award in 1989 the Padma Bhushan in 1991 and the Padma Vibhushan in 2001. 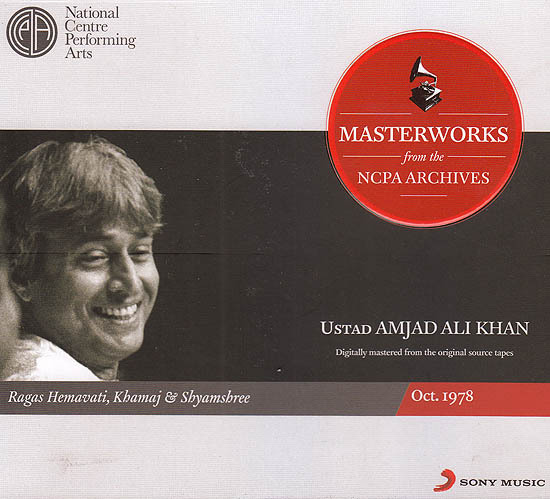 Described as the Treasure trove of Indian classical music the NCPA archives has over 5000 hours of music of the who’s who of classical music both in the Hindustani and Carnatic Styles. Maintained for over 4 decades in the most ideal conditions of temperature and humidity and on the best recording formats the NCPA Archives preserves and protects India’s rich musical heritage. According to the Artists themselves the work recorded on the Archives features some of their best works recorded at the prime of their careers. This wonderful ‘khazana’ is being presented to the music loving public for the first time.